Add nutmeg with cinnamon. Moist, moorish and always works. This recipe gets frequent outings at our house each winter, although it's rarely in exactly the same form twice. Don't forget minestrone is a great way to use up odds and ends of vegetables (I often add peas, green beans cut into pieces, fresh tomatoes that are a bit overripe etc) and there's also plenty of scope for substitution (e.g. silverbeet or kale instead of the spinach, spring onions if you've got no leeks). I would however recommend cooking your cannellini beans rather than using a tin, if you can, as the difference is definitely worth it (1/2 a cup dried equals about a tin, although I usually double that). If I had one complaint it's that I think the cooking times are a bit long - in my opinion you're better off cooking just until the veggies are cooked through, no more - and that's nowhere near a hour or so, as Herbert suggests. Also, I would only add pasta to the portion you're going to serve straight away, as it gets very bloated and unappealing in your leftovers. I made apple/date and apple/raspberry variations, using the milk+yogurt substitution for buttermilk. Worked fairly well except did not rise as much as hoped. Those of us who cook every day have thousands of cookbooks to choose from--but no single book assembles 125 surefire, easy-to-prepare recipes that are certain to come out perfectly. 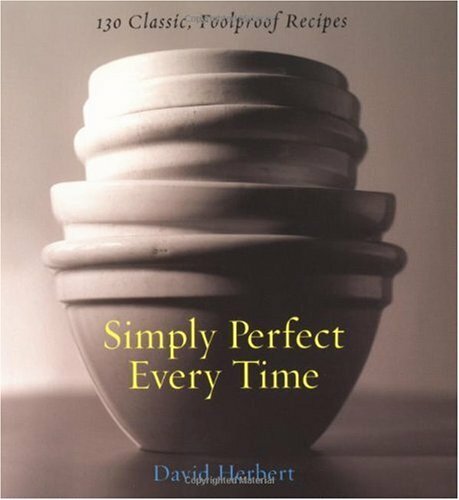 Simply Perfect Every Time collects a cook's everyday canon of recipes--perfect whether you're just starting to cook; have been cooking nightly or on weekends; solo or for family; or, after years of daily cooking, still enjoy preparing simply made dishes. Recipes cover every meal: eggs four ways (poached, boiled, baked, or scrambled) for breakfast, plus muffins and other baked goodies; sides and salads including caramelized onions, Caesar salad, and roasted root vegetables; a dozen essential soups; main dishes from beef stew to roast chicken to cheese soufflé; carrot cake, vanilla ice cream, and flourless chocolate cake for dessert; plus essential staples like marinated olives, tomato sauce, and spiced nuts. Over 50 photographs throughout are included in this all-in-one cookbook of essential, foolproof recipes.